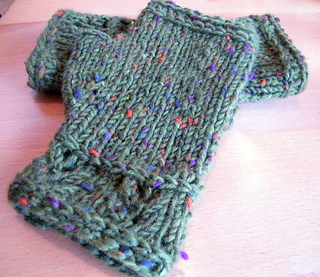 Simple, pretty, and snug, these mitts will keep your hands warm in a chilly office or on your walk down to the shops. 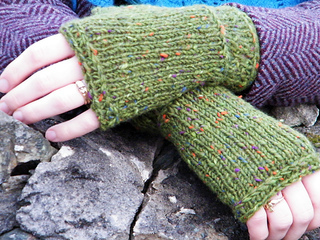 While they come in one size, a change in gauge - owing to yarn, needles, or just your own unique tension - can adjust these mitts to fit a variety of sizes. A great way to introduce yourself to lace or the Vikkel Braid, and a very, very quick project! Sizing Note: The sample snugly fits an XL hand. 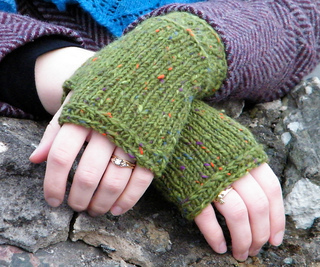 If you want a bit more room, you can change gauge or cast on a few stitches over the thumb hole.